Pure Acai Berry is ideal for you if……. What is in Pure Acai Berry? Pure Acai Berry is probably the purest and most potent acai berry product available. It contains 500mg of freeze dried acai berry in every pill. As a serving size is 3 capsule a day that is a massive 1500mg of potent acai berry every day. In case you are unaware, acai berry is a fruit that is native to central and souther America. It has gained a reputation as a very powerful detox product thanks to it’s ranking as the number 1 fruit on the ORAC antioxidant ranking list. It is also the 6th highest known food for it’s antioxidant qualities. For this reason acai berry is a great detox method. The antioxidants will cleanse out any impurities in your body and leave you feeling fitter and healthier. 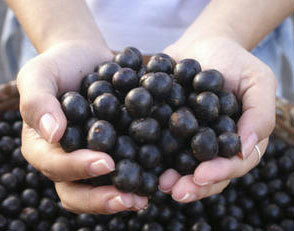 So, we have established that Pure Acai Berry is one of the most potent acai berry pills available. 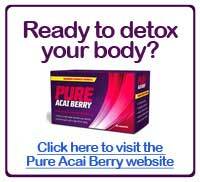 We have also looked at how acai berry can help detox and cleanse your system. However can it actually aid weight loss? The jury is still out on this one. Certainly there is no firm proof that links acai berry with losing weight. However, as an indirect link it could be said that if you detox your system you can feel healthier and more energized. This in turn can make it easier for you get and stick to a healthy lifestyle, which in turn can then help you lose weight. For this reason we wouldn’t class this product as a weight loss product (despite what their website claims). The link between acai berry and weight loss is just too weak so if you buy this, do so for the detox benefits and not the weight loss ones. 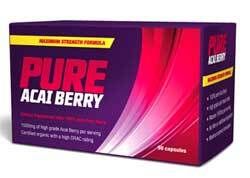 How is Pure Acai Berry different to other slimming tablets? 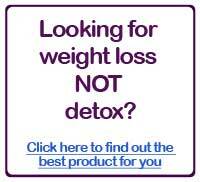 Well as we have already mentioned, Pure Acai Berry is more of a detox product than a weight loss product. 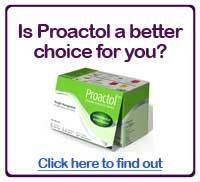 This is where it’s key difference to other slimming tablets lies. In terms of how it differs to other acai berry supplements, there are many differences. Most notable the amount of acai berry per serving which is far greater than most other acai berry products. The kind of acai berry in Pure Acai Berry is also something to note. Many products use acai berry extract which is unknown how much of it’s antioxidant qualities it retains in this form. Pure Acai Berry uses freeze dried acai berry which is the same kind that is ranked on the ORAC scale so you know it is very potent. Will Pure Acai Berry work for you? To answer this we need to go back to the fact that acai berry is more a detox product than a weight loss tablet. Sure, it may indirectly lead to weight loss but it is certainly not a primary benefit of using Pure Acai Berry. If you are looking for weight loss then you would be better off taking our slimming tablet quiz to find out which one is most likely to work for you. However, if it is a detox product you are looking for then Pure Acai Berry certainly seems to be your most likely choice. It is far superior to other acai berry products we have seen in terms of the quality and quantity of ingredients. It also has a 6 month money-back guarantee which we have never seen on other acai supplements plus it does not offer a free trial so there is no recurring billing scheme to worry about. If you feel the need to go on a detox course then we definately recommend Pure Acai Berry. It might not give you any weight loss results but it will certainly help you feel healthier on the inside which might help you make changes to your lifestyle that then lower your weight. What are the negatives of Pure Acai Berry? Well, the main negative we have already mentioned – acai berry is more of a detox product than a slimming product. Unfortunately many companies present it as an obesity cure despite there being little to no evidence to back up these claims. We feel Pure Acai Berry let themselves down a little here as they do push the weight loss benefits even if they do mention that it is a secondary benefit and not a miracle weight loss pill. They have a great product and they could gain a lot more trust by admitting that there is little evidence that it will help with weight loss and instead showing the benefits of the product as a detox pill. Other than that, the only other real negative we can see is that the product is only available online. This means if you run out half way through your detox program you will have to wait for your next order to be delivered. Because it is only available online it means it is also not ideal if you do not like giving out your credit card details online. To be fair though Pure Acai Berry do also offer telephone ordering and mail order payments to solve that issue – however to be honest ordering online is just as safe nowadays as any other method. As the list above shows, there are many great benefits of ordering Pure Acai Berry online. For starters there is free worldwide shipping available (a paid & tracked method is also available), however the one that should really excite you is the discounts on larger purchases. If you buy just one box of Pure Acai Berry it will cost you around £33. However, the more you order the more you save so if you grab yourself a 6 month supply – the cost per box comes right down to around £17, that is almost half price! For this reason we recommend you order as large a supply as you need straight away rather than ordering one or two boxes every 1-2 months. The 4 month supply is probably the best one if you are new to acai berry products and want to test it out for it’s detox powers. If you feel you will benefit more from a detox tablet than a weight loss tablet then Pure Acai Berry looks to be a good choice for you. It contains very high quality acai berry and plenty of it too, this means it should be very effective at cleansing and detoxing your system. Once you have done the detox your body should feel much better and healthier before which may help you adapt a healthier lifestyle which could then lead to you losing weight. In addition a cleansed body should be more accepting of other weight loss supplements. This means that if you have been on a poor diet for a while, you may find it beneficial to take Pure Acai Berry for a few months before starting with a weight loss aid. If you want to lose weight straight away then Pure Acai Berry is not for you, instead you would be better off looking at Proactol or Pure African Mango which we have tried and found to be very effective. Overall, go for Pure Acai Berry if you want detox, go for a weight loss pill if you need to lose weight – simple as that! Unclear I’m sure just what exactly acai berry does personally however is more enjoyable good, that is without a doubt. Keep up the truly great work. Which Pill is for You? The new hottest natural fat burner Raspberry Ketone Plus wins our product of the month award this month for its superb weight loss results. 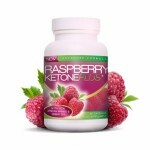 Raspberry Ketone Plus is using totally unique fat-busting formula based on real-world testing and studies that contains additional fat burning ingredients that include Acai berry, green tea and resveratrol. The information on this website is not intended to diagnose or treat any medical condition and does not constitute medical advice. Before taking any supplements we recommend consulting your GP. To help cover running costs, some links to products may result in remuneration being paid to us if a visitor purchases a product. This does not affect our commitment to providing an unbiased service. For more information please see our disclosure policy.